We’ve received quite a few testimonials lately, about our newsletters and customized tours of the western Central Valley. Thought we’d share a few and “toot our own horn” a bit. We just wanted to keep in touch with you two. We had a great time meeting you guys. The tour you gave us Paul, was amazing and filled with so much info. We really appreciated the chance to visit your home. 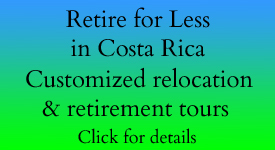 We have decided, after our trip, and tour with you, that Costa Rica is where we will land after we retire. 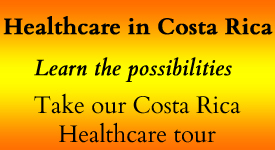 We hope to take advantage of the health care tour after we move down next October. We will be in touch. My husband an I took a tour with Paul. Not only did we get a look at Atennas, Grecia, Palmares and Sarchi but San Ramon, where he lives, was explored in-depth, on foot. His knowledge of the town shows thru our visit of Cultural Center, Museum, pharmacies, markets, shoe stores, sodas (restaurants where you order yummy casados) and his interactions with Ticos and expats alike gave us a sense that Paul has really called San Ramon, Costa Rica his home…..showing us that you get what you put in: friendships wherever you are. 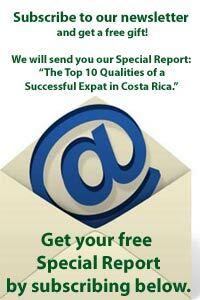 I recommend spending time with Paul if Central Valley, Costa Rica is on your radar. You will get a pretty good feel of what it’s all about: embracing the life of your fellow citizens and taking the time to interact with them. The personal rewards await you. Big Thank you Paul and Gloria. 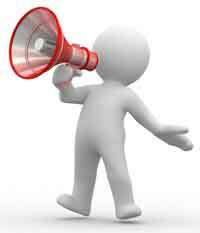 I just wanted to say that I think this was one of your best newsletters ever! I loved the story about the monkey adventure, and I think the information you shared about living in Costa Rica was very helpful.